Remember when I was getting quotes on reupholstering the Craigslist chairs? 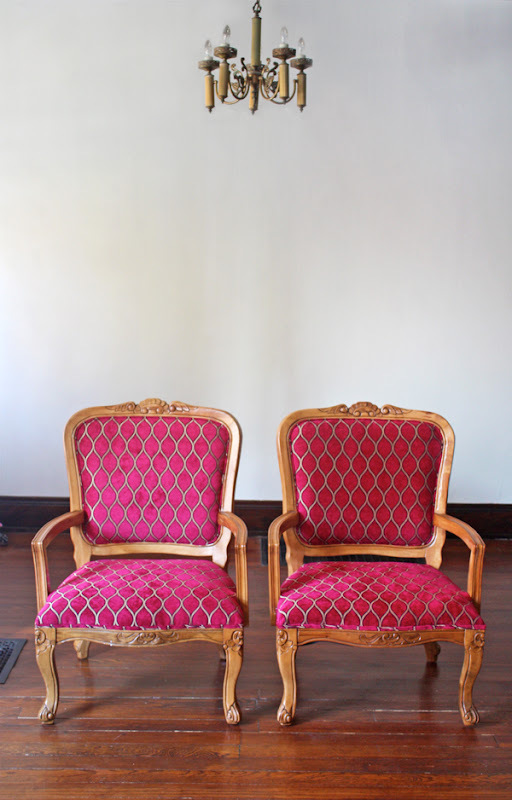 The two places I'd contacted quoted me $550 for the pair, plus fabric. A deal breaker that compelled me to try it myself. Done! Guys, I'm so proud of myself! I know this isn't the hardest upholstery project, especially because the chair padding was in great shape, but it involves sewing. Ew. Not my favorite thing at all. But I did it! Here's what they looked like before. Nothing wrong with that, except maybe the ratty pillow that came with them. But I need color. My modern and mid-century-loving self is deferring to my "try to respect the house at least a little bit" self. Our parlor is going to pretend to look a little Victorian, thus the Louis-esque chairs. But to keep it fun, I picked a crazy-colored upholstery fabric with an ogee pattern, which you see a lot in retro prints. It's soft and a little bit velvety (Iman's Malta Tourmaline). Nice. I thought maybe I could pull off this project with my manual stapler, but after some testing, I determined the staples didn't quite go all the way into the wood, and it was very hard to wedge them into little nooks and crannies. So I bit the bullet and bought a Porter-Cable air compressor from Home Depot (it came as a set with a nail gun, which could prove useful) and a Surebonder 9615 pneumatic upholstery stapler from Amazon. I'm in LOVE with these tools. Even though it was an investment, they cost about 1/3 the price of having the chairs professionally done, and I can use them on future projects. Oh, and I also bought this Double Rock staple remover, which was a life saver. 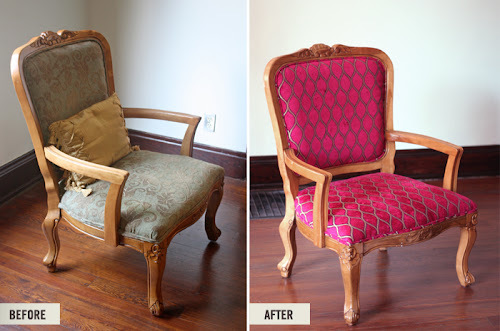 This isn't going to be a tutorial for how to reupholster a chair, since there are good ones online like this one. There's also the great book by Amanda Brown, Spruce: A Step-By-Step Guide to Upholstery and Design that I mentioned yesterday, and to which I referred while doing this project. But mostly I just took apart what the guy before me did, and copied it. I labeled the old fabric pieces with a Sharpie, marking where it went on the chair and which way was up, and then cut out new pieces in the same size. 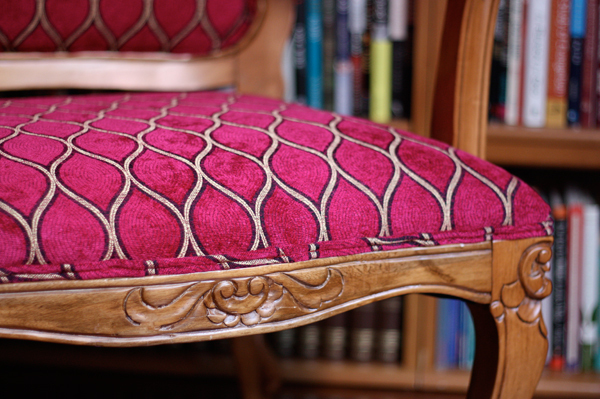 I was most nervous about sewing cord around the edge of the back piece, because it had to fit perfectly into the chair frame. I traced the old piece onto wrapping paper folded in half to ensure a symmetrical pattern, then traced that pattern onto the new fabric so I knew where the cord should lie. I cut a generous inch or so outside that line. 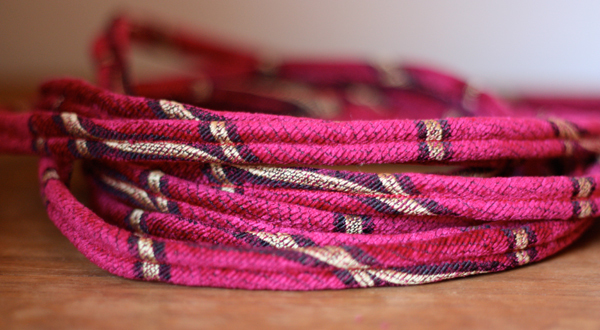 Then I laid the cord along the line, folded the excess over it, pinned, and sewed it. And it fit! A little tugging was required in one corner, but I yanked that bad boy into shape. I tucked the staples up under the cord and you can't even see them. 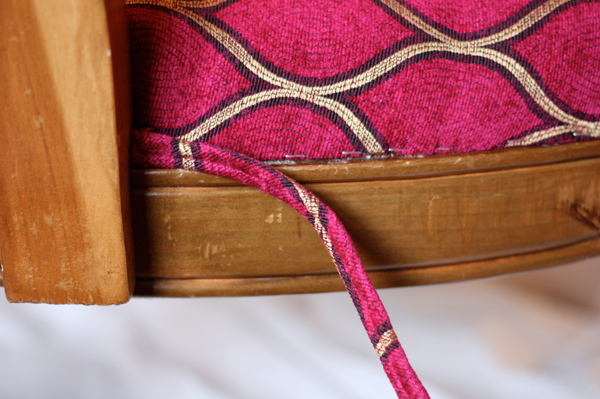 I made double welt cord (find a tutorial here or in the book) to cover all the staples around the bottom of the chair. I've never made piping before, but the $3 piping foot I bought made it a piece of cake. It was... dare I say it... fun? You can make this cord by purchasing actual double welt cord that's "double" already, or buy regular cord, just twice as much. I used actual double welt, but next time I'd use regular cord. It's cheaper, softer, and easier to find, and the sewing is the same. 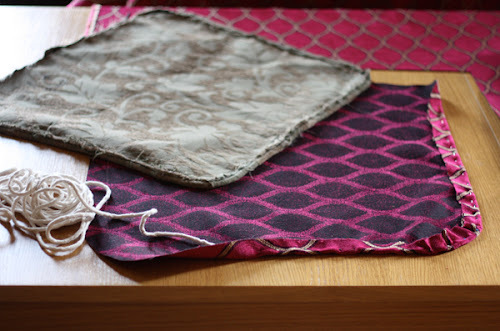 After I had the chair all covered with fabric, I wondered how I should attach the cord. 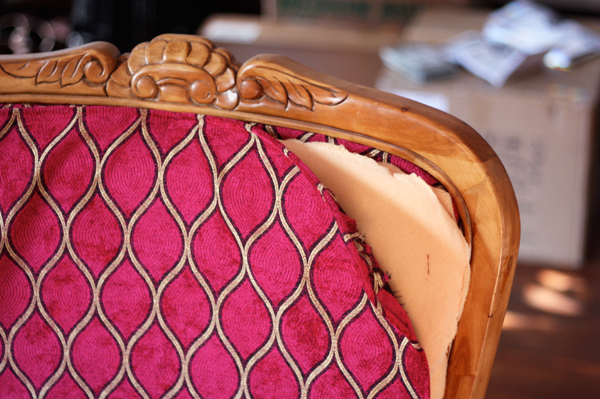 The stuff I removed had been stapled on, and you could see most of the staples when you looked at the chairs. Everything I read online said to hot glue it, and so did an upholsterer I asked, and so does Amanda's book--although she says to use a more intense glue gun than the dinky little craft one I have. She also mentioned a gimp stapler as an option. Which I also don't have. So I just used the pneumatic gun and pressed firmly to embed the staples between the two cords, hiding them in the slight fuzziness of the fabric. It worked fine and they're almost all hidden. And this way the trim will be easy to remove in the future. I thought maybe I could line up the pattern on the cord with the print on the chair, but realized that's not possible because the cord fabric is cut on the bias. That's okay. My perfectionist self can accept that. I am SO delighted with how these turned out! I mentally congratulate myself on my good job whenever I walk by them. It's so obnoxious to brag, but I don't care. I'm telling you, they're awesome. If you've ever thought about attempting this kind of project, I know you can do it. Well done! Those chairs look amazing. Love! You were right. I was wrong. Piping is pretty easy. Now. Do you think I should hang some art on that big empty wall? Yeah, piping's not worth stressing over! AWESOME! I wish your chairs were brightening up my place now. So ... one thing you didn't mention was how much your materials cost in the end (to compare with your bids). Yowza! Looks amazing! Great job! Where did you get your fabric? Sensational job on these. Oh, so THAT's how you re-upholster a chair properly! Thanks for sharing a bit of how you did it. The look of those chairs absolutely gives you full bragging rights - they look amazing. I am now thinking that perhaps I could try and tackle my lovely but sad looking Biedermeier couch. Thanks for a fabulous encouraging post. I really like that you didn't paint the wood. It works really well for these chairs. Also, great fabric choice. Your impeccable taste is why I stalk, er follow your blog! Go ahead and brag--you did an amazing job! Beautiful work, and I love the fabric you went with. I have been intimidated with the whole welting thing so have avoided it on my mini upholstery projects. Good to know that it isn't too crazy impossible. So I am rereading the post and going on the links this time. Are you telling me a pneumatic upholstery stapler is less than 30 bucks? Why am I using a manual one and having to hammer in the staple the rest of the way. But the staple remover is $22? That seems high for just a hand tool. But having the bend would make it work so much better than a screwdriver. Hmmmm....I don't have any upholstery projects in mind but will give these some thought if/when I venture back into something. Thanks for the recommendations. Very impressive! You have a right to brag. Too bad your mom doesn't live nearby, because I know she's got some mad sewing skills. Great improvement from Before! I really like the pair of chairs. Well done! I've just started a professional upholstery course, we start with small projects, but I can't wait until I get to tackle chairs like these. Brave of you to do it without any training, the end results definitely looks good!! Great choice in fabric. Fun and bright, but not "hey, I'm from another century and don't match the time period AT ALL" (a personal pet peeve of mine). I'm also SO GLAD you didn't paint the wood. Everything looks excellent just the way you have it. Wow fantastic job you've done there. Way to go, you did such a professional job! Thanks for the pats on the back, everyone! Yay! This project used about 2.5 yards. I didn't save the air compressor receipt so can't remember how much it cost. $100-something. I was on the fence about spending the money, but now I'm glad I did. Your chairs turned out great! You have inspired me to revisit my dining room chairs which have been half way done for about 2 years. I've been hung up on the sewing/cording! What a great project! We're elated that you used Spruce as a reference while working on this project. Thanks for sharing and great work! What a great blog! We're thrilled that you used Spruce as a reference while working on this project. Great work and thanks for sharing! They look amazing. The best part of it is that it's done! Your choice of fabric is very nice. These look FABULOUS! You rocked it, and I love the fabric! Thanks for the tool recommendations. 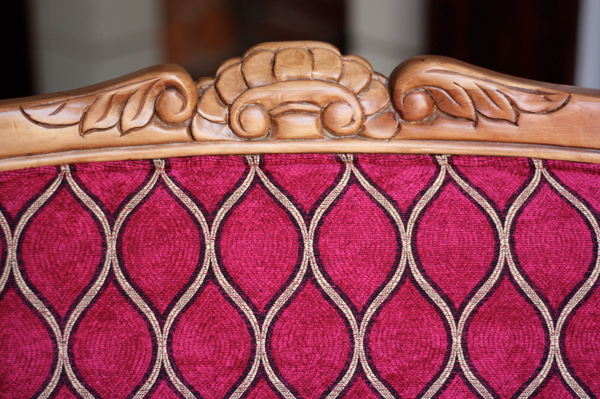 I think any upholstery project is tough. Way to go! You are a genius! They look amazing! Beautiful work Jessica! You SHOULD be proud of yourself! Incredible job! I can only hope that if I did something similar that they would half as good. haha! You are totally entitled to brag! Well done! Great job and congratulations! They look amazing! Wow, those chairs look great! Hi, I was wondering what the compressor is used for? do I really need it or can I just use the stapler? The stapler is powered by compressed air, so you do need it. You might be able to rent one from the tools dept. at Home Depot; check it out. so my friend lets me borrow her air compressor but it seems like it's for tires? are there different kind? I'm ordering the stapler now and should arrive soon. I feel like I'm gonna be contacting you more often (haha). could you email me at tviesss@gmail.com when you can? thank you!